As the year draws to a close, most of the bigger competitive gaming events of the year are behind us. All except for one: Dota 2's Boston Major. After a number of roster shuffles and evolutions to the game’s meta following the summer’s International 2016, the Boston Major is a chance for new teams to establish themselves going into the winter and the groundwork for a new competitive landscape to be laid prior to the game’s next big patch. Of course that’s not the only thing going on this weekend. There’s plenty to catch up on in the world of Smash Bros, Hearthstone, and more, with details on how and when to watch below. Despite complaints about the tournament’s single-elimination structure, the Boston Major has so far delivered plenty of great matches and dramatic finishes. Now, with a prize pool of $3,000,000 on the line, four teams are left to see who will take first place at the last premier Dota 2 event of the year. The semifinals began today at 10:00AM EST with Evil Geniuses taking on OG to see who will face the winner of Digital Chaos and Ad Finem’s best-of-three series at noon. The finals will then be a best-of-five held at 6:00PM EST tonight. You can watch all of the games in the stream below. 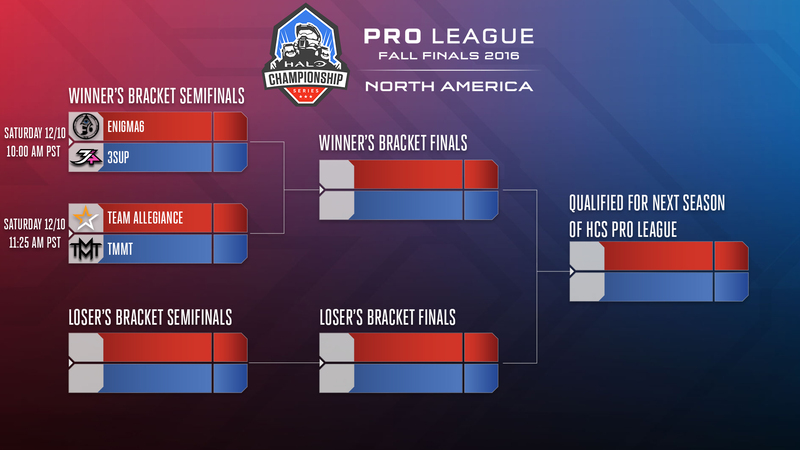 The North American Halo Championship Series: Pro League Fall Finals are this weekend. Matches begin today at 12:45PM EST with four teams left. Team EnVyUs, OpTic Gaming, Team Liquid, and Str8 Rippin will face-off with $150,000 at stake. Matches will be play all day tomorrow starting at 12:30PM EST, and the grand finals scheduled for 8:00PM EST. Meanwhile, in the relegation bracket, four teams, including Enigma6, 3Sup, Team Allegiance, and TMMT, will battle it out to see who will earn a spot in next year’s Halo Pro League. You can watch all of those games here. You can catch up on what you missed of the Esport Championship Series here. Battling for a piece of the $750,000 prize pool, Cloud9 takes on OpTic Gaming today at 12:15PM EST, followed by SK Gaming against Immortals later at 4:00PM EST. That action will be followed by more tomorrow begining at 2:15PM EST with the finals going down at 9:00PM EST tomorrow night. You can watch those group stage matches here. The Showdown: Battle Royale is this weekend, with a full schedule available here. The event features Smash Wii U, Melee, Project M, Smash 64, and Brawl, along with players like C9 Ally and MK Leo. You can watch it live here. There’s also Eden, a regional Melee tournament in Chicago. A full schedule of the event is available, and the grand finals will take place tomorrow around 9:00PM EST. Watch all of those matches here. There’s plenty to catch up on pro Hearthstone with the Esport Superstars event going on in Germany this weekend. Hearthstone fans from around the scene, both streaming and competitive, will fight over a prize pool of €25,000. Matches will play out across today ending early in the afternoon, with the grand finals scheduled for tomorrow at 3:00PM EST. You can find all the matches right here. A tournament in Europe this weekend will be people’s first chance to see pro Pokémon trainers take each other on in the newest versions of the game: Pokémon Sun and Moon. The European International Championship began yesterday and will go all day today, concluding with top 8 play tomorrow around 9:00AM EST. You can watch your favorite little pocket monsters destroy one another here. Finally, the open play phase of Overwatch’s Winter Premier event are going on this weekend. The open qualifiers will give teams from North America the opportunity to make it to a group stage which will eventually lead to a January tournament featuring a $100,000 prize pool. You can watch this weekend’s qualifiers here.